Light a candle in honor, originally uploaded by The Bacher Family. My son David was inducted into the Honor Society on May 17. Proud Dad, of course, took lots of pictures! 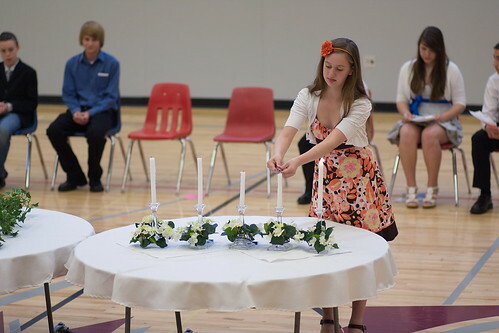 This is a favorite from the set, as the second inductee lit one of the candles on the table at the front of the "stage." She looks so poised, and that peach colored dress and flower are so pretty, and I'm so pleased with the crisp focus and shallow depth of field. I love my 85mm prime lens!